(14506, Mike Williams Collection, OHS). Located in northwestern Blaine County, Canton is situated south of the North Canadian River at the intersection of State Highways 51 and 58. The site was selected when the Kansas City, Mexico and Orient Railway crossed the river in 1905. Canton derived its name from Cantonment, a nearby military post that was established in 1879. 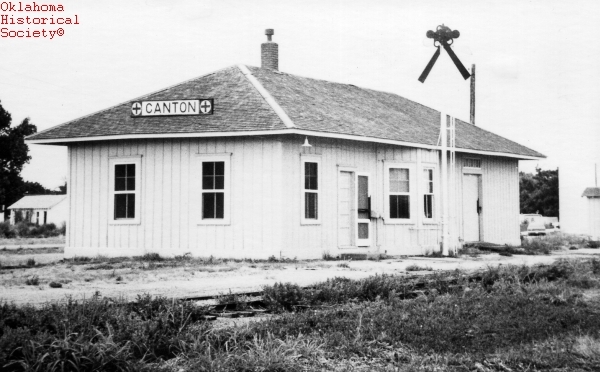 On August 5, 1905, the Union Real Estate and Townsite Company set up a town lot sale, and Canton sprang up overnight. Early-day Canton had a grocery store, a lumberyard, two livery stables, and three saloons. The first church was the Methodist Episcopal, built in 1906. A small, wood-frame building served as the school until a two-story, brick building was constructed in 1910–11. In 1910 Canton had a population of 703. By 1911 a blacksmith shop, a grain elevator, cotton gins, and hardware stores served the surrounding area, in which farmers grew wheat, cotton, corn, broomcorn, and sorghum. The city park provided a place for baseball games and band concerts. In October 1923 the North Canadian River overflowed in one of the worst floods that Canton had experienced. Not long after this event local residents began to agitate for flood control. Finally, in 1938 the U.S. Congress authorized the Canton Lake project. The U.S. Army Corps of Engineers started work on the Canton dam prior to World War II and finally completed the structure in 1948. In the late 1960s the Canton Chamber of Commerce inaugurated the Walleye Rodeo, a fishing derby that established Canton Lake's claim as "the Walleye Capital of Oklahoma." After climbing from 582 in 1920, Canton's population peaked at 959 in 1950. At the turn of the twenty-first century it had declined to 618, but in 2010 the census counted 625. With several churches and a school, the community continued to serve the surrounding agricultural region. The local economy was also based on oil production and the United States Gypsum plant at nearby Southard, which employed more than three hundred. Canton (Oklahoma) Times, 4 August 1955 and 31 July 1980. Don Foster, "Canton," The Encyclopedia of Oklahoma History and Culture, https://www.okhistory.org/publications/enc/entry.php?entry=CA047.